For a growing part of the globe the new year has arrived. Here, from the BBC, are some fireworks of celebrations that happened a few hours ago. And perhaps you've wondered why January 1 is the day the new year starts when there are so many other dates available. And finally, another from the BBC: the alternative news end-of-the-year winner and runner's up. One of the latter is our own St. Paul vertical wall climber, the wee racoon that could and did, informally dubbed #MPRracoon and Wally, naturally. The editors of the British science journal Nature chose the best science images of 2018. Included in this gallery are personal favorites of each member of the Nature art team. 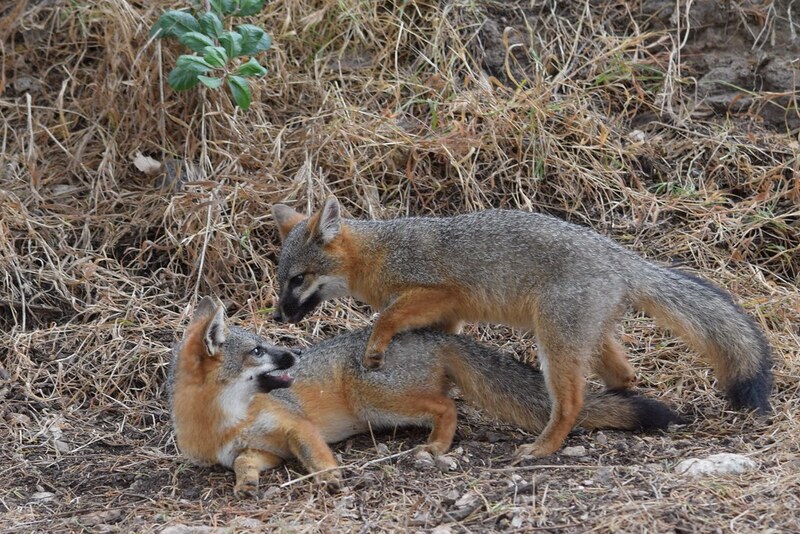 There is only one place on the planet where island foxes live, the Channel Islands, near Southern California. In the mid-90s they began disappearing, e.g., in 1993, more than 1500 lived on the largest of the islands, Santa Cruz. By 2001, fewer than a hundred remained and the foxes appeared headed for extinction. NPR's Skunkbear tells the story from near extinction to recovery. It is an incredible story about the effort and ingenuity required to save a species. The North Dakota Geological Survey (NDGS) offers fossil digs for non-specialists. has announced its 2019 fossil digs. The season runs from late June through the middle of August. Participants must be at least 13 years old with the exception of Family Days when the minimum age is 10 years old (these are half-day only). Each dig is one or more days in length but if you are a first time digger, there is a limit of two days. Digs includes dinosaurs, fossil plants and animals. Physical requirements are based on walking/hiking and terrain. "Beginnner" sites involve minimal walking; "intermediate" sites are moderate in distance and terrain; and "experienced" sites require more hiking/walking over rough surfaces. Information about this program, including past years, is found in the NDGS announcement of the 2019 fossil digs. Becky Barnes is an NDGS paleontologist who is involved in this program. You may learn more about her and view a short video here. Space is limited and fill fast. 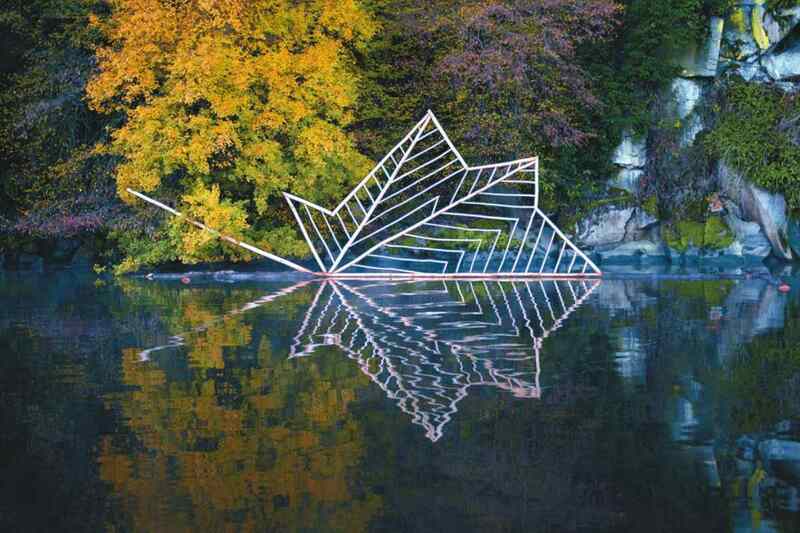 3QuarksDaily posted some art, environmental art, today, the 24th of December. Included are some links to the artist's works. Perceptions is a recurring category on this lively and informative blog. My favorite common name for dandelions (Taraxacum officinale) is blowballs although lion's tooth is a close second. The latter is from the French--dent-de-lion. The mechanism of the flight of dandelion seeds has now been analyzed and and was reported in a paper in the journal Nature. The structure is well known: The seeds are suspended from a parachute-like stalk. The parachute itself, known as a pappus, is made of many bristles. Blow and off they go. The secret to their flight is the spaces between the bristles. Writing about the research, Jeremy Rehm notes that "When some animals, aeroplanes or seeds fly, rings of circulating air called vortices form in contact with their wings or wing-like surfaces. These vortices can help to maintain the forces that lift the animal, machine or seed into the air. "Researchers thought that an unattached vortex would be too unstable to persist in nature. Yet the light, puffy seeds of dandelions use vortices that materialize just above their surfaces and lift the seed into the air." 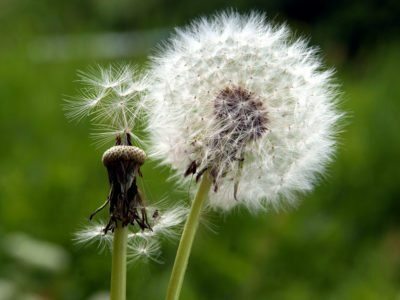 The effectiveness of the dandelion's parachute depends on the spaces between the bristles, "an example," according to Rehm's reporting," of how evolution can produce ingenious solutions to the most finicky problems." According to Rehm's article, the number of bristles per seed between 90-110 bristles, a range one of lead authors, Naomi Nakayama calls "scary consistent." This consistency makes all the difference. If you read Rehm's report you will find out why. Rehm's report which includes a short video explaining and showing the details may be found here. I hope you cast a vote in the People's Choice category (for Science magazine's website visitors) for the science breakthrough of 2018. You may read about the winner and the runners up here. In addition there is a video and discussion of three breakdowns in science for 2018: climate-fueled disaster rises, political action stalls; an ethically fraught gene-editing claim; and Brazilian science gutted. Margaret Noodin is the writer of this Friday poem. One of the entries on climate scientist Katherine Hayhoe's webpage is titled, "The Biggest Part of My Carbon Footprint is Travel ." It is a reprint of article published by DW.COM (July 3 2018) on reducing her carbon footprint, about which she is very much aware and thinks about "all-the-time." She concludes that flying less is the best way to reduce it. This is consistent with everything I've read. 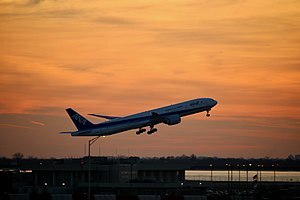 Flying is carbon costly to the planet. Here are some things considers. --When asked to speak Hayhoe asks whether she can do it virtually. The response, including among her colleagues, is "Huh?!" (My word.) She said she is trying to change the culture and will continue to ask. --Hayhoe accumulates "several events to attend in any one area before" she will travel. In her planning, Hayhoe also chooses centrally located accommodations near public transit. --"She also offsets her travel-related emissions with a certified program called Climate Stewards that invests in local economies in Kenya, Ghana and Mexico. 'They are ultra-careful in ensuring that the carbon offsets they invest in are sustained.'" --Hayhoe drives a plug-in hybrid car, bicycles, invests in high-efficiency appliances, and uses a clothesline. In addition, their household is powered by a local co-op that includes wind energy. She is honest about her institution, Texas Tech, a university that so far has shown no interest in alternative energy use even though it has more than 250 sunny days per year, "and where wind and solar energy prices are some of the lowest in the country." I was interested in whether Texas Tech has a campus wide environmental initiative. Texas Tech does have an Office of Sustainability. In my quick read of the web pages these seem to be the priorities: recycling, a bicycle friendly campus and energy conservation (energy use appears to be increasing which seems related to cooling needs. This poem for the last Friday of 2018 is by Roberta Hill, an enrolled member of the Oneida Nation of Wisconsin. One of the attendees at the United Nations COP24 conference in Poland last week was a 15-year-old Swedish environmental activist, Greta Thunberg. She made an eloquent, passionate, powerful and informed statement. 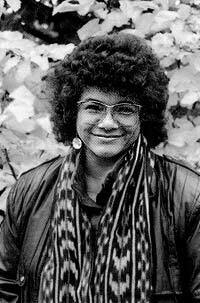 In it she refers making headlines just for skipping school about which she wrote in a column for the Guardian, "As a student, one way I can push for urgent change is to go on strike from school. 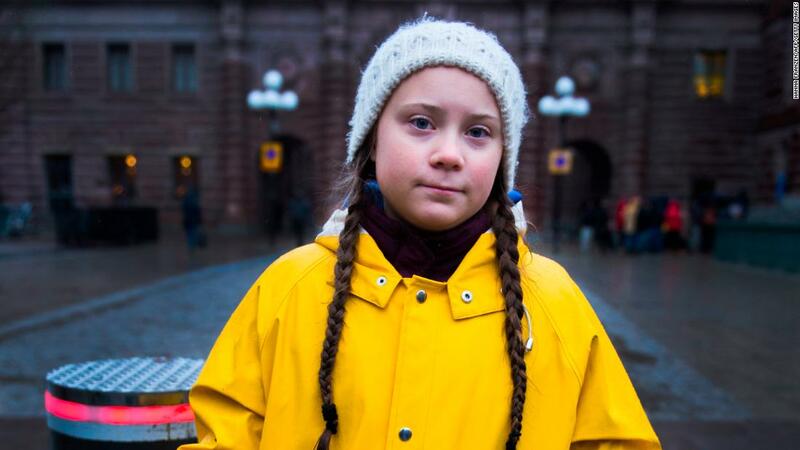 I’ll be sitting outside the Swedish parliament every Friday from now until my country is in line with the Paris agreement." 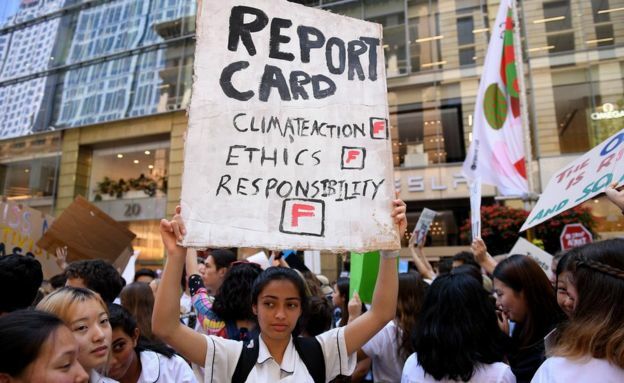 Lawrence Davidson of CNN reported on Greta Thunberg and included her statement which is found below. If you prefer, here she is delivering it. 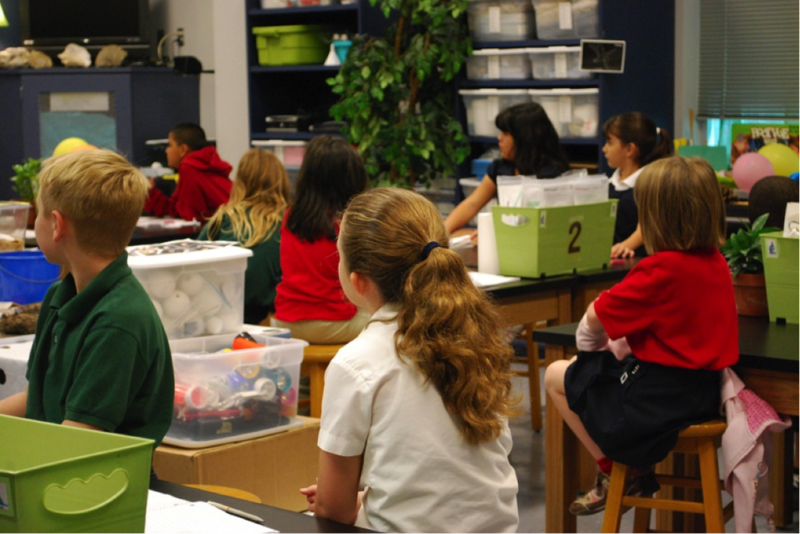 As you know Minnesota's draft science education standards (last updated 2009) include the science of climate change, especially that climate change is caused by us. It encompasses a considerable amount of important and relevant science, among them the use of models. The topic of climate change is likely to be "hot" in some districts--like the warming atmosphere--as noted in a recent MPR story. There is the science of climate change (I consider the science settled even though there are details to study.) and the (political) science of climate change, as Charles Lane wisely observed in a widely reprinted column from The Washington Post. I will add a few comments at the end that expands on Lane's concern. Lane cuts to the chase quickly. In brief, the truth is we don't want to stop climate change, i.e., we don 't want to pay for it, "the only sense," in Lane's words, "that really matters." The collective "we" deserves some attention. In the United States the "we" shows a clear divide. Supporters of "green" policies tend to be Democrats and those who oppose such policies tend to be Republicans. Support for X is one thing, action on X is another. Still things are much less clear when it comes to implementing policy changes that favor the environment. "Washington," as Lane points out, "a deep-blue state, rejected a state-level carbon tax in a 2016 initiative and did so again in 2018, by large margins each time." Minn Post's Ron Meador provides some details on the results of an array of green initiatives voters across the country found on their ballots in 2018. The column's headline is a brief summary, one not worth cheering about: "It's hard to find much of a 'green wave' in this year's voting on ballot initiatives." Meador closes with this comment, "One lesson here, I guess, is that even in bad years for green ballot initiatives it's not hard to get people to vote for more parks, so long as the cost isn't too high. Surely a good thing--but a new direction for America." (emphasis added). This is not to say that we are ever given clear choices. Great effort is made by those who prefer gray to green to cloud issues. Even without better data, Lane is quick and I think right to note that public policy choices are very likely influenced by "well-funded efforts to sow climate change skepticism, in recent decades," amplified by the current administration. This is putting it mildly. I hadn't thought about what Lane calls "multiple veto points" in the way our particular form of government is structured and works. It "tends to postpone dealing with long range crises even more than most democracies, as our failure to shore-up the solvency of federal entitlement programs shows." Lane writes, "The inconvenient truth...remains. It's not easy to persuade citizens of a democracy to accept real financial sacrifice in the here and now, for the sake of a diffuse benefit in the future." The rocket science side of climate change is the "easy" part and it would be a disservice not to provide students opportunities to learn about it; the "deficit" in Lane's view is a "democratic" one." one. It is the hard part but worthy of the engagement of high school students and well within the the purpose of schooling so long as those leading the discussion and student probes into the material with their point-of-view. I can't find a word/phrase for another kind of science important in climate change not considered by Lane. I'll use "civic/corporate" science to describe it. Isn't that a grabber?! It is one that I'd expect young learners to discuss in their discussions of global climate change. What I mean by it is what local governments and corporations are doing to reduce their carbon footprint. Xcel Energy, for example, has a target of 50% less carbon emissions by 2022. Their web page describes it and other actions to which they are committed. Corporations such as Ecolob, Thrivent and Pinnacle Services are finding as Holly Dolezalek who writes for Minnesota Business put it so colorfully "that far from sending them into the red, green really is the new black." St. Paul has set a target of 2030 to make public buildings carbon neutral (zero emissions) by 2030 and private buildings by 2050. Minneapolis has a number of climate action goals including reducing green house gas emissions by 30% by 2025 and by 80% by 2050 which is described on their website Minneapolis Sustainability. It includes a tracking function so citizens can see where the city is. These kinds of initiatives raise interesting questions. Why have they recognized the danger of global warming and made a decision to lead the way when others either deny it or claim that responses would damage society. One might wonder why capitalists are leading the charge? "Beyond the Diagnosis" is an exhibit of paintings of people with orphan and medically neglected diseases. This exhibit was withdrawn recently from a two-month showing at the National Institutes of Health (NIH). The reason surprised me. Annette Maughan at STAT writes that according to the NIH Clinical Center, 'the hospital art curator expressed to the exhibit organizer that one of the portraits in the collection of rare disease portraits may evoke negative emotions in patients.'" Rather than remove the "offending" portrait, the organizers decided to withdraw the entire show. The purpose of Beyond the Diagnosis is "advancing medicine through art." Here is the mission statement. "There are 7,000 rare diseases. Rare diseases became known as orphan diseases because drug companies were not interested in adopting them to develop treatments. Less than 5% of all orphan diseases have a treatment. There are no cures. People living with orphan diseases experience long diagnosis times, few medical experts, no treatments, financial hardship, and emotional stress. "The Beyond the Diagnosis art exhibit’s focus is the orphan disease patient. Artists have donated their time and talents to paint orphan disease patients for this groundbreaking exhibit. Each portrait represents a single orphan disease. Our goal is to put a face to all 7,000 orphan diseases. This beautiful exhibit is traveling to medical schools, research institutes and hospitals around the globe encouraging the medical community to look “beyond the diagnosis” to the patient. "Art has been used for thousands of years to successfully convey a message, whether it be a story or a glimpse into the human spirit. At Beyond the Diagnosis, we believe art not only leaves a powerful and lasting visual imprint but creates a unique connection for the viewer." The web page includes many paintings, information, a gallery of the artists who have donated their time and art, and itineraries of past exhibits. Interestingly, one of the testimonials is from NIH. " The Clinical Center hosted the exhibit in 2016, 2017 and looks forward to exhibiting 'Beyond the Diagnosis' again in the future." I read Maughan's essay shortly before I discovered a short, powerful video from the BBC. It features the work of Angela Forker who photographs babies with severe and terminal illnesses. She places them in richly imagined and beautifully photographed fantasy scenes. The effect is moving. The short video is titled "Why I Take Photos of Babies with Severe Illnesses." The Clinical Center hosted the exhibit in 2016, 2017 and looks forward to exhibiting “Beyond the Diagnosis” again in the future." Today's poem is by Lucille Clifton. On the occasion of her death The New Yorker published a glorious essay about Ms. Clifton's life and work. 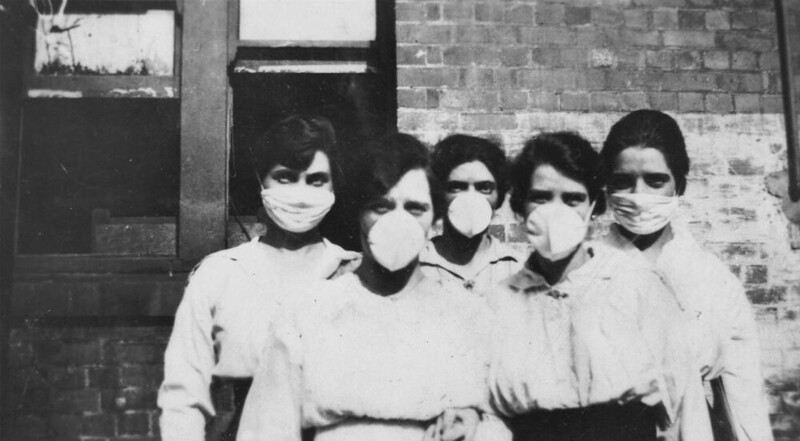 The origins of the 1918 pandemic influenza epidemic, the so-called Spanish flu, are not known and perhaps never will be. The origin story I know is that it emerged in Haskell County, KS, in January 1918, jumping from another host to humans. There are other claims, including some from other countries. There is a new development in this story and it was reported on by Helen Branswell in STAT (December 5, 2018). What follows is the short version. University of Arizona Ecology and Evolutionary Biology professor Michael Worobey, who has an interest in disease origins, used a very familiar tool, the Internet, to search for any descendants of William Rolland, a WWI military doctor. A year before the outbreak of the Spanish flu, Rolland had reported on an outbreak of an unusual and fatal respiratory illness. Worobey's curiosity was whether any of Rolland's human tissue slides from the sick had been saved. In this age of electronic information it may not surprise you that it wasn't long before Worobey received a reply. Retired family physician, Dr. Jim Cox, had a collection of Rolland's human tissue slides which had been handed down and saved for several generations. Cox is married to Charles Rolland's daughter. Worobey has had ten of the slides for a few years. He and his team have been developing a technique to look for the influenza virus in the tissue samples without destroying the slides. You likely remember glass slides with their delicate coverslips from a biology course. On slides one saves the slip covers are glued permanently to the supporting base. They are saved as records and also for use in teaching. Worobey acknowledges that his quest is a long-shot and that is likely, as Branswell writes, "'we'll just get no result at all. That's something to keep in perspective. But if we find something, whatever we found relative to flu would be really interesting and informative." I urge you read Branswell reporting for it provides fascinating details on a much more complicated story than described here, e.g., on what informed Worobey's internet search, the nature of the unusual "explosive behavior" the virus exhibits when it emerge, the unusual death curve of the pandemic (a W shape--the central peak captures the deaths of the most vulnerable adults), the use of evidence and the role of a probing curiosity in science. 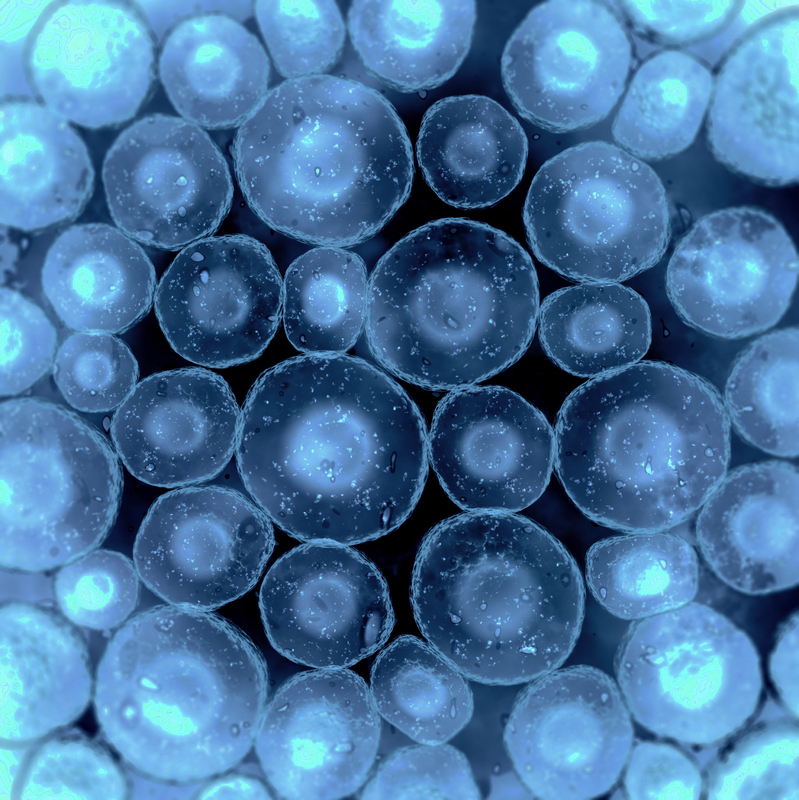 The article includes a photograph of several of Rolland's human tissue slides which appear almost as fresh as the day they were made. *The N part of the name (neuraminidase)--there are 9 of them--allow newly synthesized viruses to escape from the infected cell and spread. 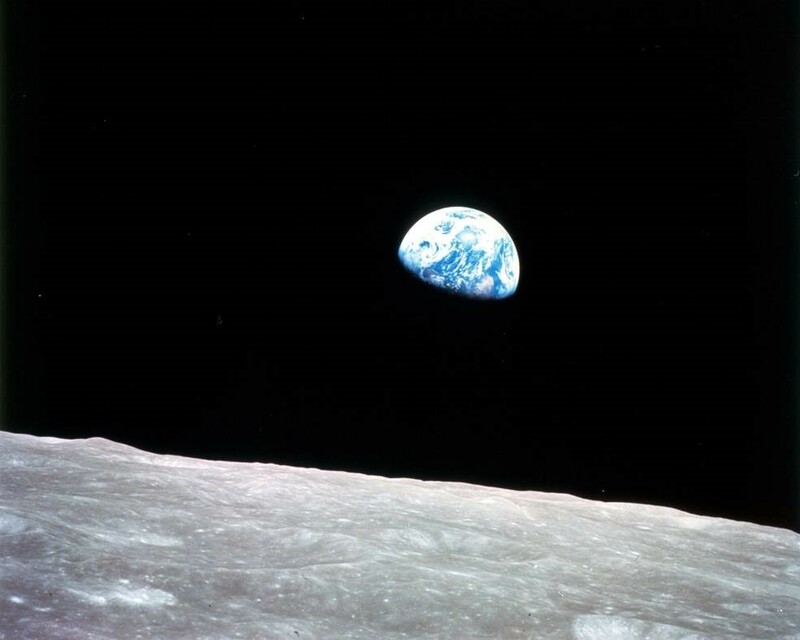 I never grow tired of this picture taken from the Apollo 8 expedition to the moon and back. Astronaut Frank Bormann narrates this short film on what has become an iconic photograph of the earth in space. He calls attention to just how unusual Planet Earth is in our solar system. Earth is colorful; the moon dull, black, white and tan. The image is apt today, perhaps more apt than ever as global climate change is a genuine threat to the planet and its future. We are also in the midst of another international meeting in Poland--COP 24--to come to grips with beginning to attend to the problem rather than just making statements about it. Bonus: COP 24 has a short video today with a kids voice. As you know there is a big meeting in Poland, some 200 nations, to talk about climate change, no to turn talk about climate change into actions. The BBC produced 7 charts to show where we are which includes what each of us can do. There is a guide, too which you can tap and load down. Included are temperature trends, the record setting year of 2018, where we are in meeting targets (need considerable improvement), the largest emitting CO2 nations (take a guess at the top two and then order them), climate risk to urban areas in terms of growth, and the state of arctic sea ice. CBS This Morning devoted some time to an interview with John Urschel, December 8. He really was a student-athlete, playing varsity football (lineman) at Penn State and playing it well enough to be drafted by the NFL's Baltimore Ravens in 2014. You gotta' love the way Urschel chose his university major and how it changed his view: "I majored in aerospace engineering at Penn State because my mother told me I was going to major in aerospace engineering," Urschel said. "I was good at math, I was good at physics. I didn't particularly love it but once I got to college I got to see math in a pure form." Before the NFL, though, he graduated in three years, staying at Penn State to complete two master's degrees. In this interview he describes how he "benched" mathematics to play professionally but realized that mathematics hadn't released its hold on his imagination and intellect so he played football and enrolled in a Ph.D. program in mathematics at the Massachusetts Institute of Technology. He retired from football in 2017, after three years in the NFL. Urschel is aiming to graduate with his Ph.D. this spring. In this interview Urschel talks about his life, his aims and hopes, and about breaking down stereotypes that surround minorities and college athletes. He closes with some useful advice. "If you have dreams, if you have goals, don't shut these things down. Don't fit into certain stereotypes. Don't think you can't have multiple aspirations," he said. "Life's too short. It's too short to settle and to live someone else's dream." This CBS segment seemed less of an interview and more of a conversation between two people interested in the other and in the topic at hand which makes it all the more enjoyable and interesting. There is a lot here to chew on and also to be glad you know about.